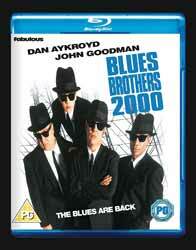 Blues Brothers 2000 is a comedy that's not very funny, not very big on story and not that well mapped out. However, where it does score big is in its impressive line up of Blues musicians who turn up to perform in the film's final act, not to mention the artists who pop up throughout the movie. Forget the story (which actually makes little to no sense); ignore the film's logic (it suddenly introduces a bizarre sci-fi element for absolutely no reason whatsoever) and instead focus on the music and the huge car pile up scene. It's a film that didn't really need making. If you're a fan of the original Blues Brothers movie then you're either going to love it or be annoyed that they've trampled over everything that was good about the first film. The Blues Brothers without John Belushi just doesn't work.